Empty fields by the railroad tracks, gin bottles in brown paper bags, a drainage ditch runs through it, no signs of all the things that were. 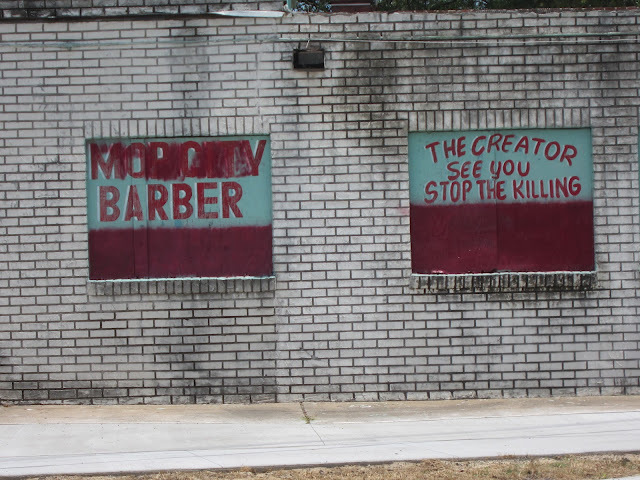 All up and down Moncrief Road are housing projects, dilapidated cemeteries, liquor bottles in brown paper bags. 1950s, hundreds of black Christians in suits and long dresses and festive hats and dark pants and white shirts and ties crowd about the swimming pool. On either side of the pool is a long covered wooden breezeway, and behind the pool a big wooden arch centers the word, “BATHING.” The religious revival will last days and dozens of new converts will now be baptized in the pool. The swimming pools are fed by the natural springs that give this place its name. Another legend says a Frenchman named Eugene Moncrief buried nine chests of jewelry and gems by the springs, and left eight of them buried there when local Indians killed him. The story seems to have first appeared when the Moncrief Springs resort was under development in the 1870s. No race track now, no swimming pools, no bathhouses, restaurants, dancing pavilions, bowling alleys, no crowds of people betting on horse races, no streetcar terminal, no religious revivals, no springs. No springs. No springs any longer inhabit Moncrief Springs. The name itself, Moncrief Springs, is a ghost in an overgrown field. 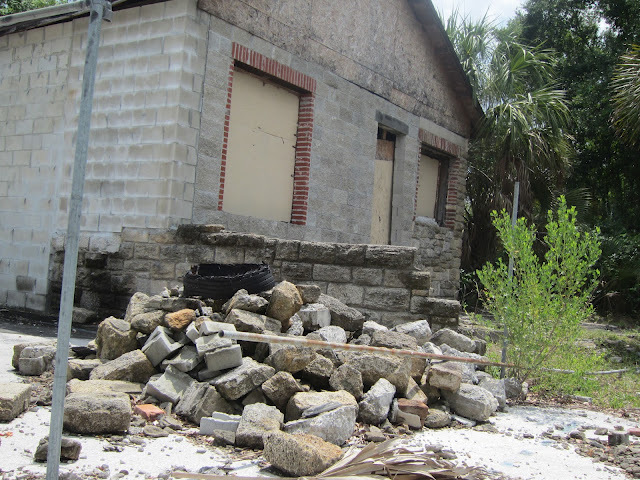 The last of the bathhouses was demolished in the 1960s, and at the same time, the City of Jacksonville covered and diverted the springs into a drainage improvement plan. The irony of the destruction of the springs is that in 2011, the quadrant now called 45th and Moncrief still has no city sewage infrastructure. What was in the 19th century a resort area four miles out of town, named for its natural springs, is in the 21st century a desperately poor inner-city neighborhood with no city sewage service. 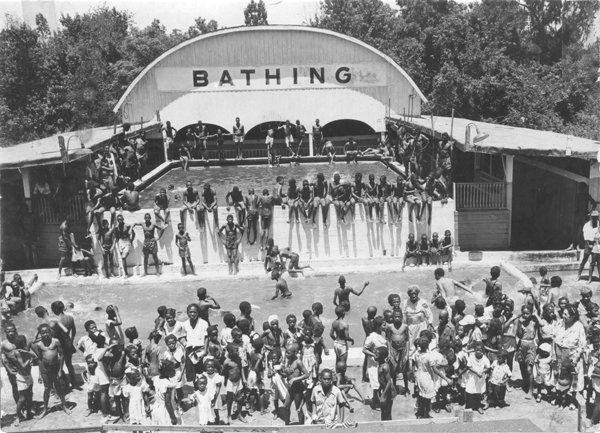 In the mid-1940s, Eartha Mary Magdalene White, Jacksonville’s own Gandhi of Civil Rights and activism for the poor, bought 18 acres of Moncrief Springs, renovated the swimming pool and bathhouses, and opened them up to the city’s black citizens, since every other public swimming pool in the city was whites-only. 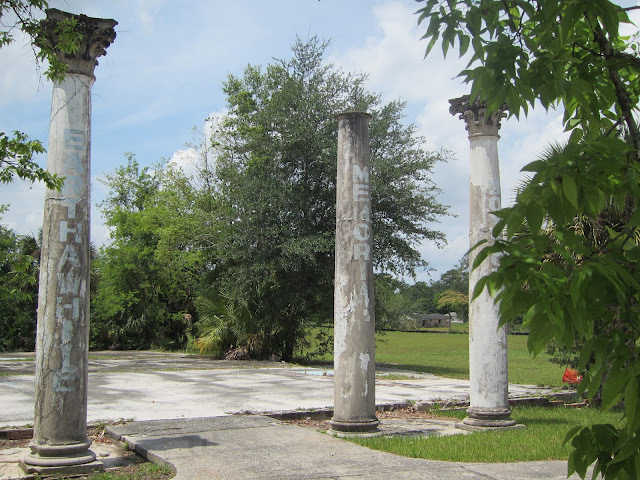 The abandoned Eartha White Memorial Boys’ Club is what’s left of Moncrief Springs. The windows of the brown and gray fieldstone bungalow have long been boarded up, the boards in the back loose and dislodged. The white paint on the wide wooden Doric columns on the bungalow’s porch is chipping. A handsome black teenager with dreadlocks and neck tattoos rides up to the place on his bike and stops to look at it. This is as close as he’s ever come. All through his childhood, all the adults told him and his brothers to stay away from it. They told him someone had been murdered here and had his head cut off. Now he wonders if it’s true, or if they were just trying to scare him to keep him away. He doesn’t know who Eartha White was. 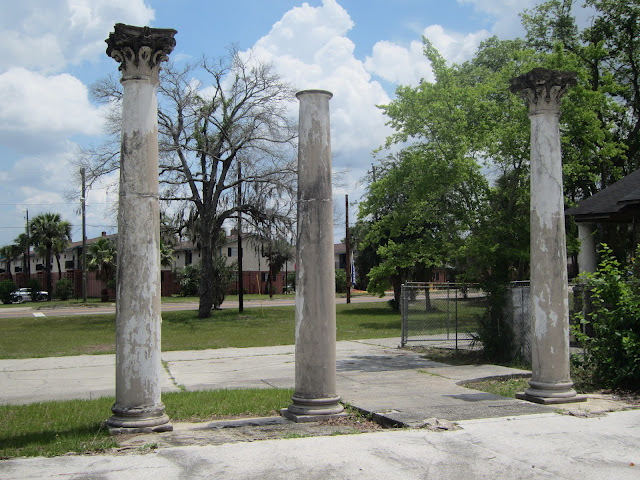 To the right of the bungalow, directly facing Moncrief Road, stand three Corinthian columns, beautifully capitaled, the pilasters themselves bearing faded, hardly legible big blue words. The words on the first column are “Earth White,” the word on the second is “Memorial,” and the words on the third column are “Boys Club” [sic].